A prominent Spanish-Jewish family, members of which are known from the thirteenth to the fifteenth century. In Spanish documents the name is always written Adret, and in a Hebrew manuscript in the Bodleian Library (No. 2218 = Pococke, p. 280b) we have the punctuation . In a poem of the sixteenth century in favor of the study of philosophy, the name is punctuated (H. Hirschfeld, "Jew. Quart. Rev." xii. 141). The form "Adereth," given by some writers, is therefore wrong. The family very probably obtained its name from a place—either the village of Les Adrets, department of Var, France (compare François de Beaumont, Baron des Adrets), or from some town in Spain ("Rev. Ét. Juives," xxi. 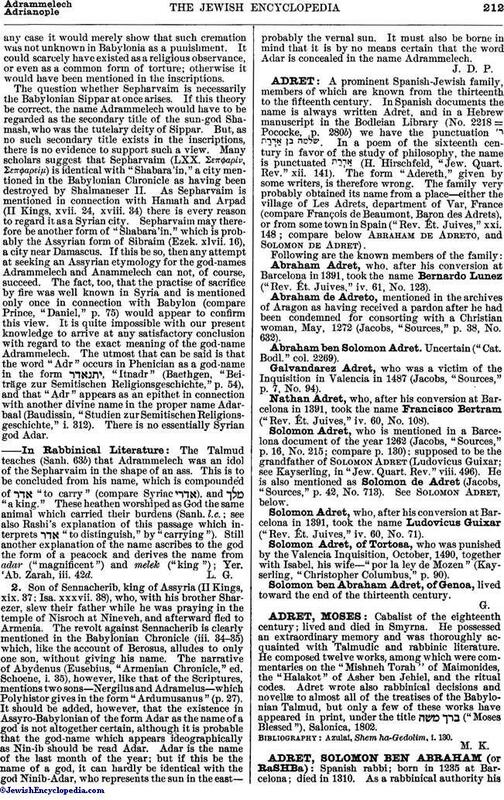 148; compare below Abraham de Adreto, and Solomon de Adret).